Now that Black Friday has passed and Cyber Monday is upon us, T-Mobile has announced a new deal that’ll only be available on Monday. 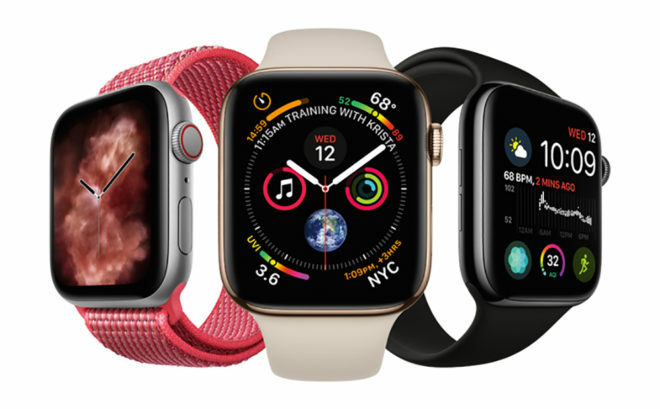 On Monday, November 26, new customers can get a free Apple Watch Series 4 or Series 3, Samsung Galaxy Watch, or iPad (6th Gen) when they join T-Mobile. To get this deal, you’ll need to activate a new account with at least one voice line and a DIGITS line for the Apple Watch or Galaxy Watch or a 6GB or higher mobile internet line for the iPad. The fine print of this deal says that you’ll get up to $529.99 to cover the cost of your Apple Watch, Galaxy Watch, or iPad (6th Gen) (32GB or 128GB). The bill credits will be spread out over 24 months and will begin within two bill cycles after purchase. If you cancel service, the credits will stop and the remaining balance at full price will be due. T-Mobile also says that your device must be purchased on EIP. This deal is only available through T-Mobile.com or Virtual Retail, so you’ll need to incorporate T-Mo into your online shopping list this Cyber Monday to get it. And you won’t be disappointed. T-Mobile has zero deals, period. Even last year we had the Z2 Force with no BS attached and this this year there’s zero deals. Name the last time there was a deal where no trade in, add a line, or bill credits were part of it. I’ll wait. T-Mobile only has deals for new customers or for Add A Line. It’s pretty frustrating that us current customers can’t get any deals. Like seriously? I’m confident T-Mobile is still providing you the best deal or you wouldn’t still be a customer currently. Even so, I’ve taken advantage of many “new” offers like taxes and fees included and free Netflix. A lot of the people complaining about the add a line or new customers deals either already have a cheaper plan than the new one they need (thus, you’re getting a better deal than the new customers anyway), or want something for nothing (a free line or device, just because). There are also some discounts that old customers get (like $10 kickback credits) that new ones can’t have. TBH, I’m getting the 20% off for life, plus kickback, plus on the one plus promo. There’s one thing keeping me at T-Mobile and it’s none of those, it’s the unlimited data with 50 gb and not being deprioritized if we go over (yet). That’s it. Verizon works better in Utah and I go in a lot of office buildings and in half my data speed is almost useless at times. I travelled south on I-15 where there’s supposedly great service and I couldn’t stream music on an iPhone 7 Plus. When it works it works great but there’s a lot left desired in my area. Can you just give some discounts on some phones? Seriously this is pathetic on T-Mobiles part. Meanwhile Best Buy sold more smartphones over Black Friday than any other product and you can guess which carrier wasn’t a part of it. When I worked at best buy I always thought it was because they didnt do “contracts” at the start of uncarrier but now that everyone is doing it they have no excuse. Tmobile started out with better deals and cut out the third party, who used to give better deals. Now they set the standard, and everyone else followed. Now they have the joke 3 year financing and they’re locking people in so they can’t switch. Basically rip people off directly instead of paying third party to do it. They had deals earlier in the month and even in October. Can’t blame them if you missed out. What deal are you speaking of that didn’t include adding a line or trading in a device? The deal that gave you $390 off a new iphone Xs Max, Xs, or Xr. All you had to do was buy an $80 google pixel from ebay to use as a trade. If you had an iphone 7 like me, you could then sell it for $275 and walk away with a $1,000 iphone Xs for $415. Before tax of course. So what you’re saying is there’s a lot of what ifs and no guarantee and just like others stated a lot of BS to go through to get a deal. You also forgot one MAJOR part of that deal, bill credits for three years to get the $390. Who in their right mind wants to be tied down to a company that long? Not me and not many others. No what ifs at all. And if you think buying a phone on eBay and selling one on swappa is “a lot of BS…” then you must be a millennial. And if you think verizon or AT&T are going to be cheaper thank TMobile over the next 3 years then I think you need a reality check. I’ll take the bill credits as I don’t plan on leaving for a more expensive company anytime soon, nor do I plan on leaving for a cheaper company with worse service. This deal worked perfect for me. Obviously you weren’t a good candidate. All I’m saying is just give a discount with no hoops to jump through. I don’t go to Walmart for a new TV and have to Trade in my old one and add another new TV to my house just to get a discounted price. What deals are you talking about? They had non especially if you are referring to the ones that required an additional line which still caters to new customers because it forces you to add another line. Sprint had an S9 for $48 for existing customers. VZW had $400 off of every 2018 flagship for existing. I just wish they sold it more places so you could shop around on phone deals. How about a Galaxy Watch for existing customers. Wow, tmobile has become like every other company, only caters to new customers. They don’t care about current customers except to get their money. I honestly don’t know why a new customer would go to T-Mobile. Their service is not that great and their prices are close to Verizon’s. I have an old plan from over 12 years ago and this is the only reason why I am sticking with them. Last week I went to a mall in Northern MI and couldn’t make a single phone call. No data neither. It’s looking to be that way. Although for many in cities it is the best option. Reason i’m sticking with them is because of a grandfathered plan and their service beats verizon where I live and work not to mention on my last roadtrip they were solid, even in the mountains in nc and Tennessee. I was really surprised. With this 600 band upgrades things are looking good and that is one reason why they are pushing for new customers and forgetting current ones. I guess we’ll see what they do if they do anything for current customers that doesn’t involve jumping through hoops. Damn, it’s as if I wrote your post myself! I switched to T-Mobile from Verizon because they aren’t playing games with their customers the same way big red and blue are. After being screwed by Verizon time and time again I got fed up and switched to them. Yeah they aren’t perfect but how many times has Verizon or any other company actually listen to customer feedback the same way T-Mobile does besides a small mom and pop shop somewhere? In terms of coverage yeah they could be better but hell, who couldn’t? Verizon has spectrum for days but just sits on it like AT&T and Dish does without actually using it. The coverage in my area could be better yes but at least they are giving us active updates about what’s happening in the network and where updates are rolling out. I for one really like T-Mobile in how transparent they are with most things and it’s not just hype that falls flat. Of course they could be better and improve but compared to everyone else in the market, they are the most forward thinking and honest company I’ve seen in the wireless market to date. That’s just me though, I came from a plan with Verizon that had tiered data and I wanted to pull my hair out each month because of the bill I got most of the time. When T-Mobile announced their unlimited plan amid a sea of the same from one carrier to another i checked the coverage in my area and jumped ship almost immediately. Coverage isn’t perfect but it wasn’t with Verizon either so eh, that’s what you get for living in Mississippi, nobody has amazing coverage but AT&T and I’m most certainly not jumping ship to that hot mess of a carrier.